Of course, I can understand why most people in southeastern Indiana know little to nothing about Orthodox Christianity. A huge majority of the people in these counties, who are at least nominally Christians, are either Protestant, Roman Catholic, or, in much smaller numbers, Mormons. The nearest Orthodox churches to Madison, are in Louisville, KY. That’s 50 miles away. Now if you went up to central and northern Indiana, you’d find many, many Orthodox churches, so the general population up there has at least a reasonable amount of knowledge about what Eastern Christianity is all about. Some Catholics believe that the Eastern Christians “split off” from the Roman Catholic Church. No; that’s not the way it was, at all. You see, Christianity began in what we call the Holy Land; that’s where Jesus was born, where He preached, and where He was crucified. Anyone who knows anything at all about Christianity, knows that. After His death, His surviving Disciples traveled widely in the Middle East, preaching the Gospel and making many converts. St. Thomas even went as far as western India, establishing the St. Thoma Oriental Orthodox Church there. And of course, the Disciples also spread Christianity into Europe, including Rome, which was finally converted by the Emperor Constantine after St. Peter’s martyrdom there led to his designation as “the first pope.” But the churches of Eastern Christianity, which organized themselves by country, instead of “big tent” fashion as the Western Christians did, only considered the pope as “first among equals” with the other church leaders, such as the patriarch of Constantinople — not the leader of the whole body of of the followers of Jesus Christ. Think of it this way: The Roman Catholic Church — Western Christianity — evolved into something like a unitary republic — say, like France, only on a much greater scale. The Orthodox churches — Eastern Christianity — evolved into something like our 50 states. In other words, each country of Eastern Europe, including Greece, Russia, Serbia, Bulgaria, Romania, the Ukraine, Georgia, and a few others, built its own, independent Orthodox church organization — but they all were “in communion” with each other. 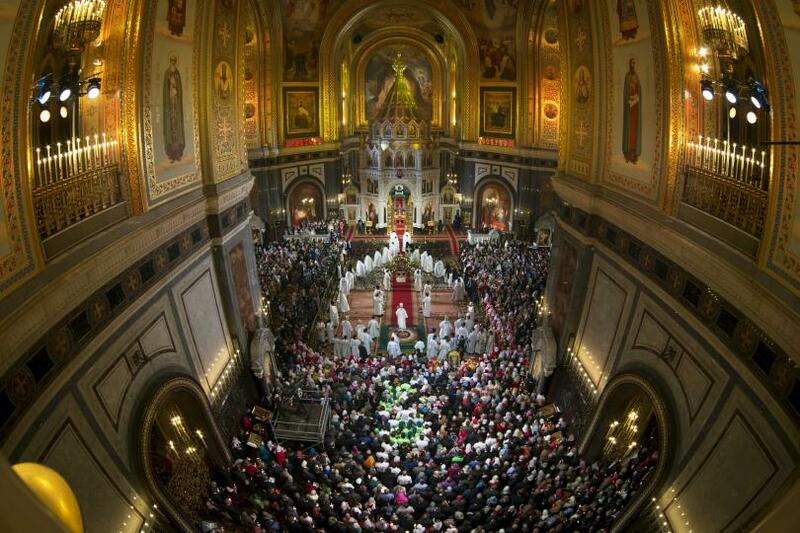 With minor national differences, they celebrated the Divine Liturgy (equivalent to the Catholic Mass) all the same way. Like the 50 states are all parts of the United States of America, but each have their own peculiarities. For instance, if you study photos of Orthodox churches from various countries for a while, you can learn to tell Russian from Greek, Greek from Serbian, Serbian from Armenian, and so forth. The Russian churches tend to tower, with “onion domes” at the top of the towers. Greek churches tend not to rise as high, to be wider, and to have rounded domes, often white, with the exterior of the church often painted blue. Serbian churches tend to be constructed more like a rectangle, turned on its side, with distinct decorative shapes to the exterior. Armenian churches — the oldest in Christianity, as Armenia was the first nation to officially become Christian — tend to LOOK old, rough, and weather-beaten. excommunication to the pope and the Catholic Church. And from that day to this, the two halves of what was the original Christian Church, have remained estranged from each other. I think my first awareness of a branch of Christianity which so many people in America are hardly aware of, was when I happened to look at a special, religion-oriented place mat in a restaurant one day, many years ago. It included prayers for saying “grace,” Protestant, Catholic — and Eastern Orthodox. I’d barely even heard of that before; but I read each grace prayer, and found there were significant differences. No, I don’t remember exactly WHAT they were; it was a long time ago. But they were there. Orthodox services combine the visual (the naves, or sanctuaries, of many of the churches are indescribably beautiful); the audible (stirring chants by the choirs, done accapella because no musical instruments are allowed); and aromatic (incense is sprinkled liberally, lending its own unique air to the services). Eastern Orthodox naves have a wall, called an “iconostasis”, at the front of the sanctuary, which divides the congregation from the altar. It symbolizes the “Gate to Heaven,” has a doorway in the middle and usually two smaller ones at either end, leading to the altar; and has icons, or holy pictures of Jesus, the Virgin Mary, and the saints, displayed across its front. The icon of Jesus as an adult is always to the viewer’s right of the Gate to Heaven; that of the Theotokos or Holy Mother holding the infant Jesus, at the left. 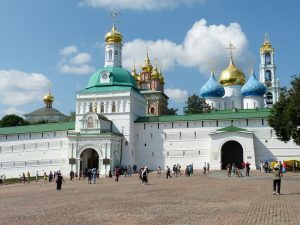 Speaking of the “Gate to Heaven,” and the “earth or Heaven” by the Russian officials who searched for a new faith for their country, it is said that Orthodox architects aim at making the naves of their churches, appear as near to what Heaven looks like — or what we humans like to think it looks like — as possible. Even though I’ve only been privileged to attend an Orthodox Divine Liturgy once in my life, in Cincinnati, the combination as I’ve seen in many videos, stirs me in a way that no service in a Protestant or Catholic service, ever did. — As I mentioned earlier, the Orthodox, convinced that they were the first, and hence, the “right,” do not cotton much to any major changes in their faith. And they don’t care what others think of that. I found that I liked that. “Be sure you’re right, and then go ahead.” The Orthodox seem to march to their own drummer — and they do it proudly. And the various national Orthodox churches in the U.S. have seen a steady stream of Protestants, Catholics, or people of no particular faith, joining Orthodoxy. — The Orthodox have fasts (as do the Catholics, by the way) at various times of the year, as prescribed by their church since its founding. This, in my belief, makes a person’s religion more central to their life; it reminds you of your faith, and of what it expects of you. And, although this may appear unrelated to that, the Orthodox allow their parish priests to marry, IF they declare themselves willing to spend their entire working lives in the parishes, and not seek to rise in the hierarchy; AND if they marry before they take their final vows upon graduation from the seminary. It’s my belief that a clergyman needs a partner, just like most men. Anyway, that’s my view about the church I’d like to join, if there were one close enough to where I live for me to attend it regularly. I don’t want to be Orthodox from afar. So, I’m still waiting … and searching … and hoping. ← Presidential race — then, possibly, revolution? Enlightening and interesting column, Old Corporal. I don’t think God much cares how you worship, as long as you keep Him in your life. I enjoyed your column very much, and saw the hard work, and research you obviously put into it. Good job! Thank you so much, good friend. I don’t know how interesting most people will find this to be, but it’s something I’ve been wanting to write, for some time. I’m interested in the Orthodox faith too, probably because of my fascination with the medieval Byzantine Empire. I don’t think I’d be comfortable with the veneration of icons though. Part of the reason I left the Roman Catholic Church was because venerating statues and saints seemed too close to idolatry for me. I see your point, David. Hadn’t thought about it that way. I think one of the biggest things that attracted me to Orthodoxy — well, two, actually — is the awsome, baroque beauty of the naves of the churches; and the air of mysticism that surrounds that whole faith. Thanks, David, for your comment.